WILDWOOD, Mo., Jan. 16, 2019 (GLOBE NEWSWIRE) -- Peak Resorts, Inc. (NASDAQ:SKIS) (“Peak” or the “Company”), a leading owner and operator of U.S. ski resorts, today announced that guests at Mount Snow and Hunter Mountain are now enjoying the completion of $31 million in capital improvements. 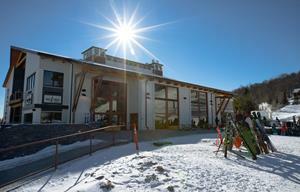 Both the new Carinthia Base Lodge at Mount Snow and the Hunter North expansion at Hunter Mountain opened to rave reviews from guests ahead of the Christmas and New Year’s Day holiday week and together have upped the on-mountain and après experience at two of the Company’s flagship Northeast resorts. Headquartered in Missouri, Peak Resorts is a leading owner and operator of 17 ski resorts primarily located in the Northeast, Mid-Atlantic and Midwest, 16 of which are company owned: Mount Snow in Vermont; Attitash, Wildcat and Crotched Mountain in New Hampshire; Hunter Mountain in New York; Jack Frost, Big Boulder, Liberty Mountain, Whitetail and Roundtop Mountain in Pennsylvania; Boston Mills, Brandywine, Alpine Valley and Mad River Mountain (operator only) in Ohio; Hidden Valley and Snow Creek in Missouri; and, Paoli Peaks in Indiana. This news release contains forward-looking statements regarding the future outlook and performance of Peak Resorts, Inc., within the meaning of the Private Securities Litigation Reform Act of 1995. These statements are subject to a variety of risks and uncertainties that could cause actual results to differ materially from current expectations. These risks and uncertainties are discussed in the Company’s filings with the Securities and Exchange Commission, including the Company’s Annual Report on Form 10-K for the year ended April 30, 2018, as updated in the Company’s Quarterly Report on Form 10-Q for the quarter ended October 31, 2018. Actual results could differ materially from those projected in the forward-looking statements. The Company undertakes no obligation to update or revise publicly any forward-looking statements, whether as a result of new information, future events or otherwise, except as may be required by law.